Circa 1928, wooden bandstand; Courtesy of Waterloo Historical Society. The two gentlemen sitting on the bench are Morris Locke and Prof. Giles Brown. The "Toggery" refers to a local downtown store. 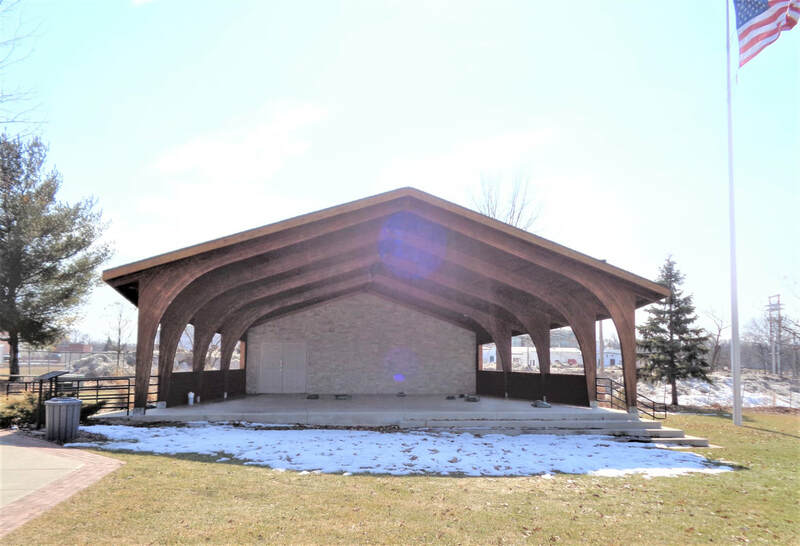 Veteran's Memorial Park is a small park (0.25 acres) located in downtown Waterloo at the crossroads of Highway 19 and Jefferson St. (The bandstand faces E. Madison St. - Highway 19). It was renovated in 1955 with funds of $3,600 donated by W. G. McKay (founder in 1897 of McKay Nursery) to have it roofed and beautified with Lannon stone. At the first bandstand, concerts were held on Saturday evenings when farmers and local residents shopped. The Waterloo City Band, formed in the early 1900s, performs regularly in Waterloo and the surrounding areas. ​In Veteran's Park, there is a memorial to local citizens who served in Vietnam from December 1961 through May 1975.